Rachel Whiteread commission "Nissen Hut"
Deep in Yorkshire’s Dalby Forest stands a ghostly white cabin. 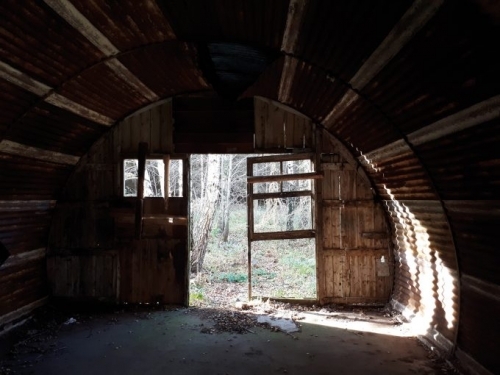 By casting in concrete, within the forest, the interior space of a Nissen hut, the prefab military structure invented during the First World War, artist Rachel Whiteread has turned it inside out. The Forestry Commission, which manages Dalby Forest, came into being in 1919 to replenish the nation’s strategic timber reserve after the First World War. Nissen huts were utilised in the labour camps created to support the planting of Dalby Forest. They were also used in prisoner of war camps in this and other forests across the country. By focusing on empty space and transforming it into sculpture, Whiteread – one of this country’s most important living artists and the first woman to win the Turner Prize – creates a haunting testament to the war’s impact on every part of the British landscape. This monument brings visitors into the heart of the forest, a living, breathing space in which to view art. For more information, please visit 14-18 NOW's website.